LearnDash is one of the most popular learning management systems (LMS) for WordPress. Available as a WordPress plugin, it can transform your site into an interactive learning platform. Users Insights now comes with a LearnDash module that gives you the tools to search and analyze your LearnDash user activity. 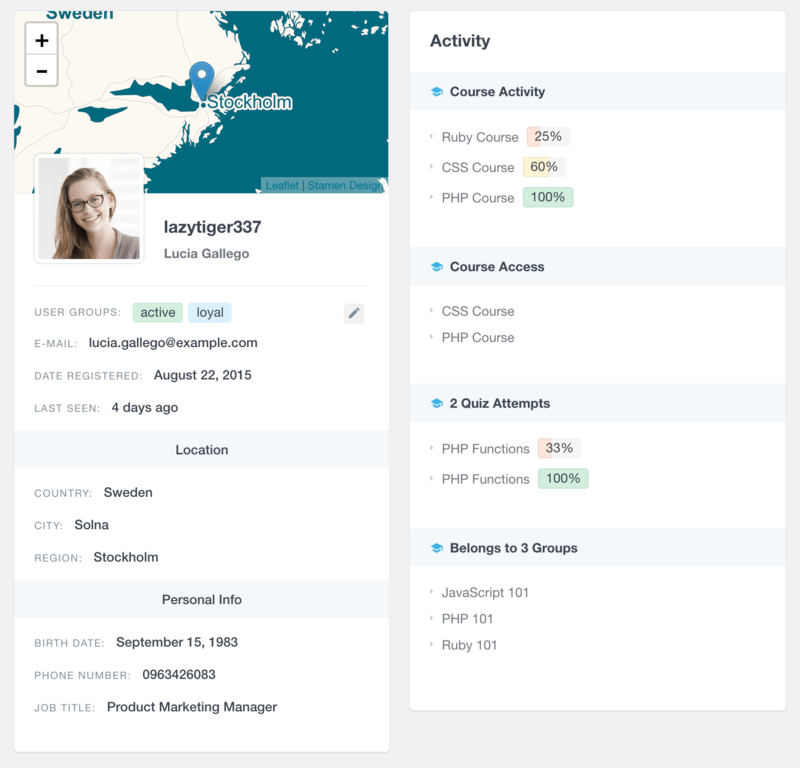 Users Insights detects the user activity, such as courses completed or number of quizzes passed and makes it available in the user table and filters. This allows you to search, segment and analyze your user list based on their LearnDash activity. Please note that the LearnDash module of Users Insights requires LearnDash version 2.3 or later, for more information please refer to this article. The LearnDash module of Users Insights gives you several different course related fields and filters. As its name implies, this field shows the number of courses that each user has completed. 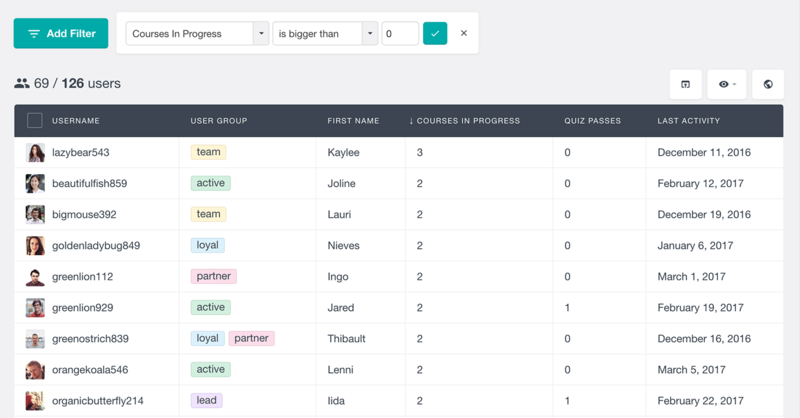 You can sort the user table by this column, so you can find your most or least active students. This field is also available in the smart filters section, which means that you can filter the user list by the number of courses completed. Similarly to the number of courses completed column, the LearnDash module also provides a number of courses in progress column. As its name suggests, this column shows how many courses each user has currently in progress, but hasn’t completed yet. And just like the courses completed column, you can sort and filter the user table by this column as well. The LearnDash module of Users Insights also provides two additional filters that allow you to search the user list by the courses that they have (or not) completed. The “Has completed course” filter provides a list with the existing courses that you can choose from. 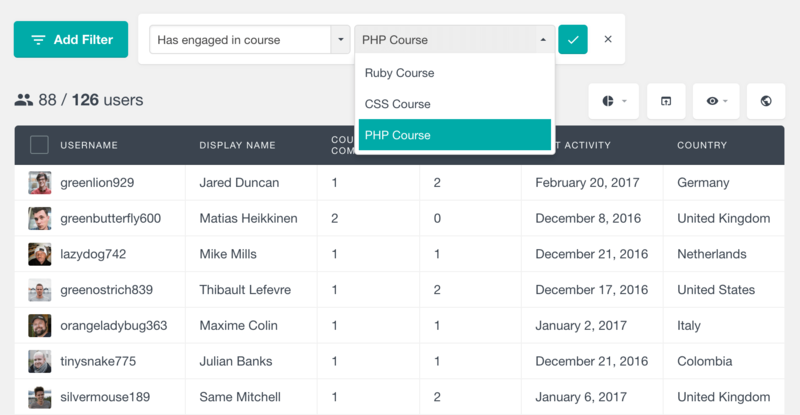 Once applied, the user table will show you only the users that have completed the selected course. In a similar way the “Has not completed” filter will list the students that have not completed a particular course, regardless of whether they have started it or not. The “Has engaged in course” filter of the LearnDash module can show you all the users who have ever started a course, regardless of whether they have completed it or not. There is also a “Has not engaged in course” filter that can show you the users that have never started a particular course. Please note that this filter works based on user activity on the course, and not access to the course. Therefore, users who have access to the particular course, but have not started it, will not be shown in the results of this filter. 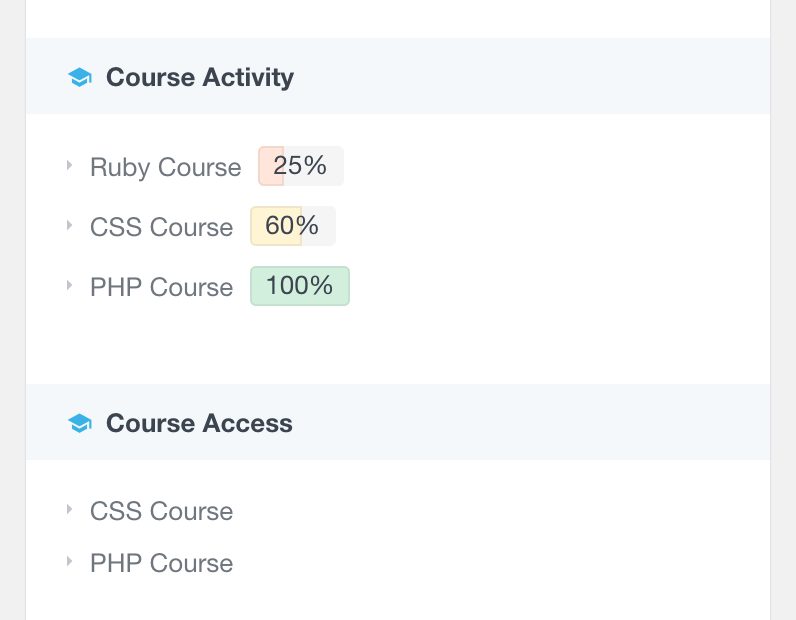 If you want to find the list of users that currently have a particular course in progress, you can just use the combination of “Has engaged in course” and “Has not completed course” filters. More details about the course activity is also available for each student in his/her Users Insights custom user profile section. As you can see from the screenshot, this section lists all the courses with the progress that the student has made for each course that they have started. Additionally, there is a “Course Access” section that lists the courses that the user currently has access to. The LearnDash module of Users Insights also provides the number of lessons and topics completed. These fields are available in both the user table and smart filters. You can easily sort the student list by these fields to find the most or least active users. You can also filter the user list by the number of lessons or topics completed. Users Insights also includes several quiz related fields that can help you analyze how your LearnDash students perform on the quizzes. These two fields will show you how many quizzes each user has attempted and how many of those quizzes they have actually passed. Being able to see this data for each user can give you an insight about how difficult your users find the quizzes. This can help you adjust your quiz difficulty level, based on your students’ performance. Users Insights also provides two additional filters that allow you to segment the user list by the quizzes that they have (or not) passed. As its name suggests, the “Has Passed Quiz” filter will list only the users that have passed the selected quiz. The “Has not passed quiz” filter on the other hand, will list the students that have not passed the selected quiz, regardless of whether they have attempted it or not. This section lists all of the quiz attempts for the selected user, along with the final result of the quiz. If you use the LearnDash Groups feature, you can now use Users Insights to filter the student list by the groups that they belong (or not) to. The LearnDash module introduces a “Group” filter that makes this possible. When using this filter, it lists all of the available groups that you can choose from. In a similar way you can find the users that do not belong to a particular group, just by applying a “Group is not” filter. Another field that Users Insights makes available in the user table is the LearnDash Last Activity date. This field is different than the Users Insights Last Seen field, which tells us when the user has last logged in. The Last Activity field shows the last time the user has performed any kind of LearnDash activity, such as starting a lesson or attempting a quiz. This field can help you see how active your students are. You can sort the user table by this field in a chronological order, so you can find your most recently active students. This field is also available in the filters, so you can easily segment the student list by their last activity date. As we mentioned above, Users Insights includes more details about the user activity in the User Profile section. If you use LearnDash, it is very likely that you might be also using some of the other plugins that are supported by Users Insights. For example, you might use WooCommerce with WooCommerce Subscriptions and WooCommerce Memberships to provide some premium courses, available only to paying members. Or you might be using BuddyPress or UltimateMember to manage your LearnDash members. You might be also using bbPress to create public forums where your members can have a discussion. In this example, we have used the Users Insights WooCommerce and WooCommerce Memberships modules to list and search the membership related data. One of the key features of Users Insights is its Export functionality that lets you export the user list in its current state in a CSV format. This includes the currently applied filters, visible table columns and sorting order. The exported user list can then be used in many different ways, such as generating reports or importing the users to a mailing list. Users Insights also includes a LearnDash reports feature that can help you further analyze your students’ activity and performance. 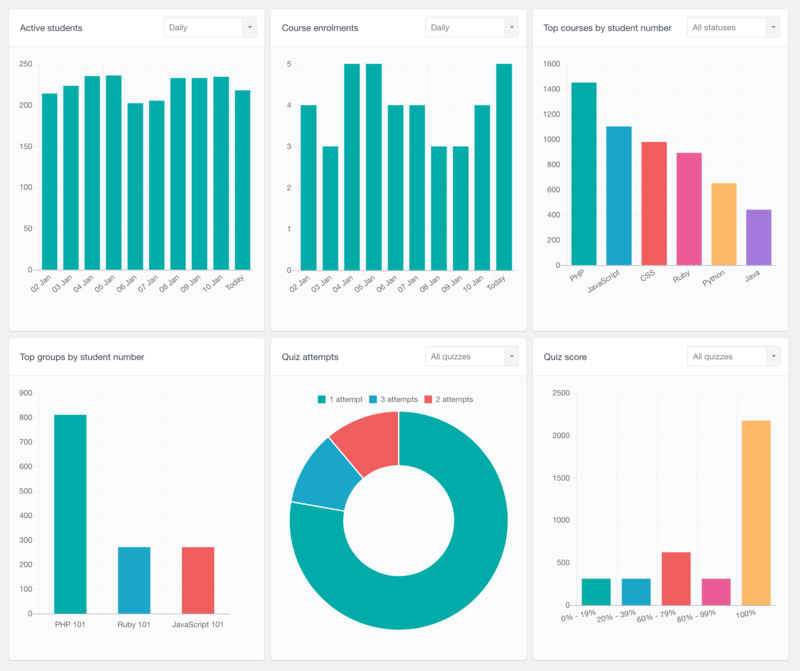 With the reports feature you can now find which your most popular courses are, analyze how active your students are over time and discover more about your students’ overall performance. To learn more about the reports feature, you can visit the LearnDash Reports page, where we have described all the reports in detail. The LearnDash module of Users Insights can be a useful tool for any size of learning management systems. Whether your site is popular or you are just starting, good user management is always a key factor to success. Users Insights can help you understand how your LearnDash students interact with your content and give you answers to the questions that you have.